RIO DE JANEIRO -- A Brazilian judge ordered Wednesday that the passports of American swimmers Ryan Lochte and Jimmy Feigen be seized, confining them to the country as authorities investigate their claim they were robbed at gunpoint during the Rio de Janeiro Olympics. It was not immediately clear whether the swimmers were still in Brazil. The office of Judge Keyla Blank confirmed the order Wednesday in a statement. The U.S. Olympic Committee said police went to the athletes village Wednesday morning to try to collect the passports, but the swim team had already moved out. Spokesman Patrick Sandusky declined to say whether Lochte and Feigen were still in the country. "As part of our standard security protocol, we do not make athlete travel plans public and therefore cannot confirm the athletes' current location," Sandusky said. "We will continue to cooperate with Brazilian authorities." Ostrow has said there is no question the robbery happened. Ostrow said Lochte had been staying in this hotel room and intended to go back to the U.S. soon. According to statements from Lochte and the USOC, the swimmers were returning to the athletes village by taxi after a night out at the French Olympic team's hospitality house in the Rodrigo de Freitas area in the upscale south zone of the city. Traveling with Lochte and Feigen were Gunnar Bentz and Jack Conger. 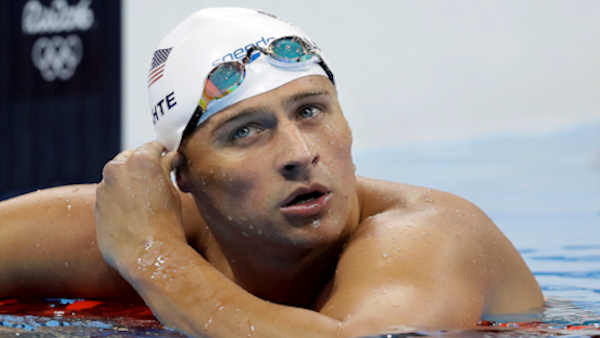 Lochte swam in two events at the Rio Games, winning gold in the 4x200-meter freestyle relay. He is a 12-time Olympic medalist. "We got pulled over, in the taxi, and these guys came out with a badge, a police badge, no lights, no nothing just a police badge and they pulled us over," Lochte said. "They pulled out their guns, they told the other swimmers to get down on the ground - they got down on the ground. I refused, I was like we didn't do anything wrong, so - I'm not getting down on the ground.